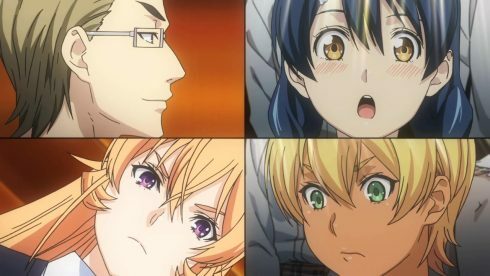 Shokugeki no Soma – Ni no Sara hits its half way point with an episode that’s both fairly predictable, and very much what you’d call the standard fair when it comes to Shounen as a genre. Despite all the hinting and setup to the contrary, there actually wasn’t some deep wrinkle or some big shocking moment that stole the show this week. Yet, that is the truly remarkable thing about that this franchise; it continues to be engaging and fun, even at its more modest moments. The Soma vs Subaru battle was the classic hero takes on the villain story, and it played out pretty much as expected. Soma won a decisive victory by going above and beyond what Subaru was capable of. In doing so, he promoted the integrity, respect and love of cooking and serving customers, that he lives by. My earlier suspicions around whether this was indeed the point that Soma would fall, were mostly proven wrong. 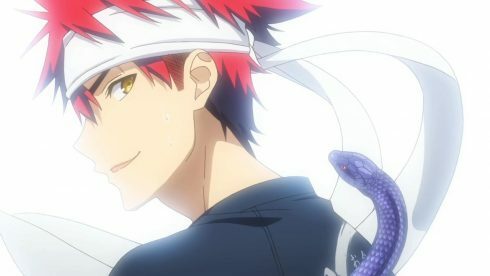 Soma kind of slipped back into the overpowered shounen lead role this week, and I’m honestly not sure how to take that. 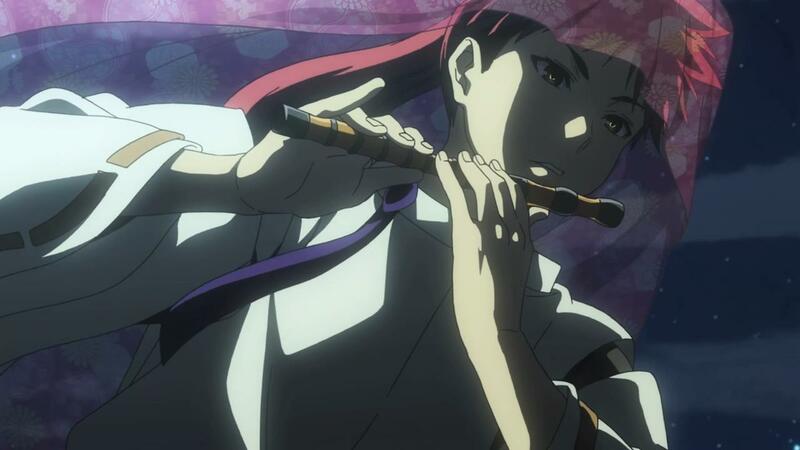 There are times, when a show just has to follow convention because it just makes logical sense. Subaru was nothing more than an obstacle for Soma to overcome, and an excuse to actually reevaluate himself. 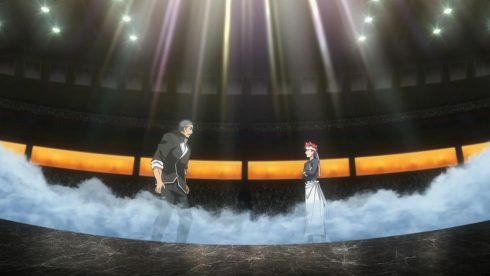 While I think the conclusion to this big showdown wasn’t all that impressive, it was the build up to it, that stole the show. 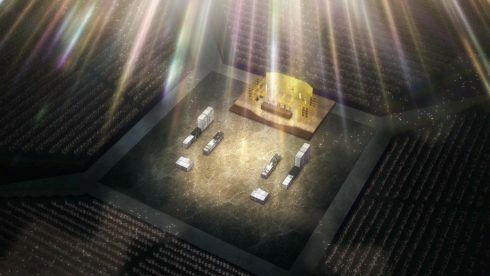 And since all of that build up happened last week, it was last week’s episode that was the special one. 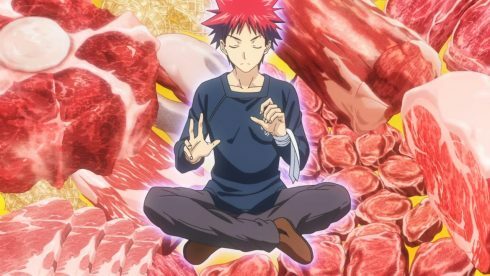 Not only that, but last week’s episode also set a precedent that this week’s Shokugeki based episode itself couldn’t even match. 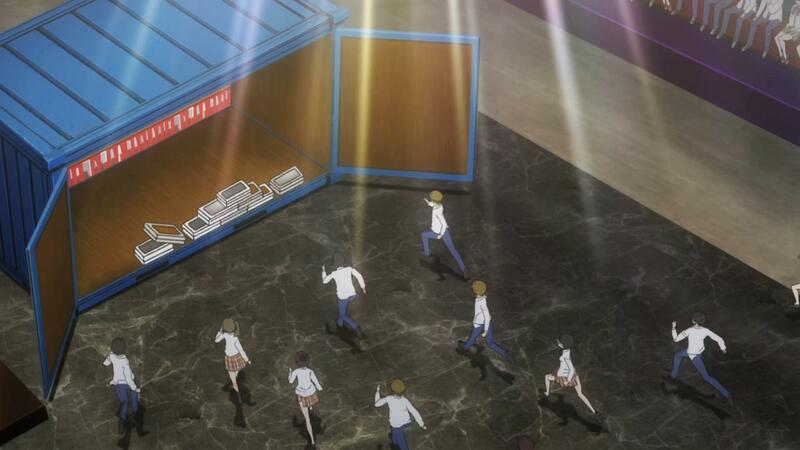 One of the big reasons for that, was how unimpressive Soma’s actual win was. 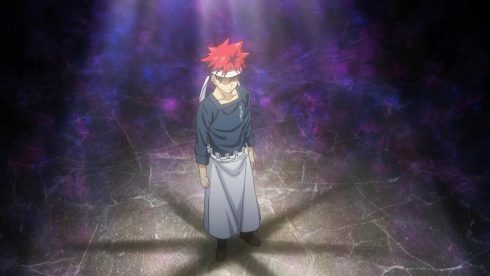 Make no mistake, Soma won because he had to win, and not because he actually pulled out some ingenious idea like he normally does. While I get the idea of the “theme park of beef in a stew” as a concept, It just doesn’t seem all that impressive when you see it in action. 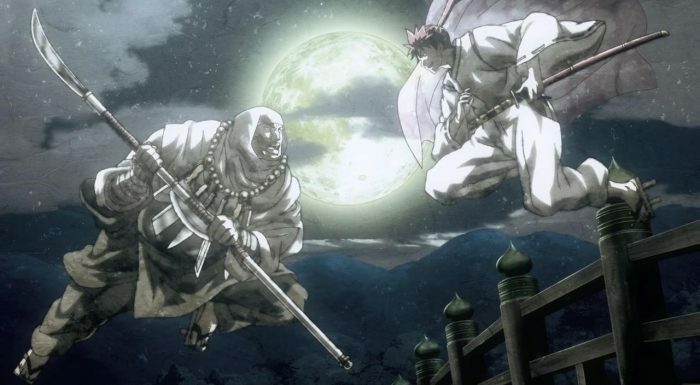 Its not on par with a lot of the other stuff that Soma has been able to do, to systematically take down and improve upon his adversaries weaknesses thus far. 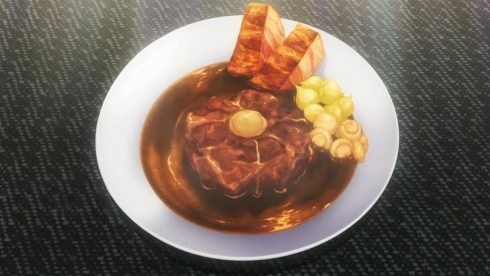 The Beef stew that Soma creates this week, full of various cuts and types of Beef as garnishees, is more or less just something that aims to be outlandish enough to go beyond normal reason, rather than something that I would actually find very appetizing. 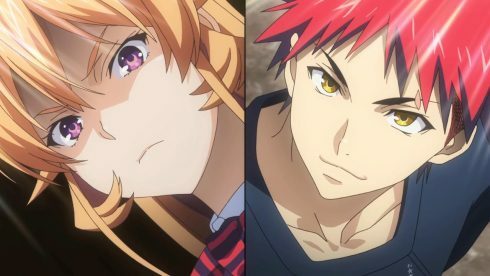 After what seems like a really long time, Shoukgeki no Soma as a show, lacked any big surprises or even just a sense oftension this week. Soma never felt like he was on the ropes, and while the show made some small attempts to try to sell the idea of his impending doom, it didn’t seem like even the show itself had too much investment in the idea. 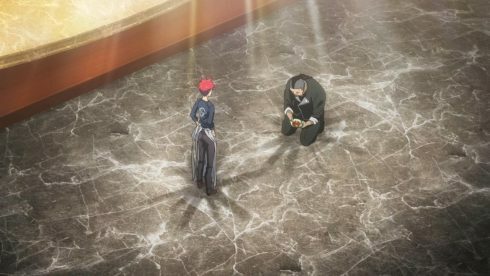 You could tell as Subaru bellowed and howled, and presented his dish first, that Soma was pretty much guaranteed to one up him. 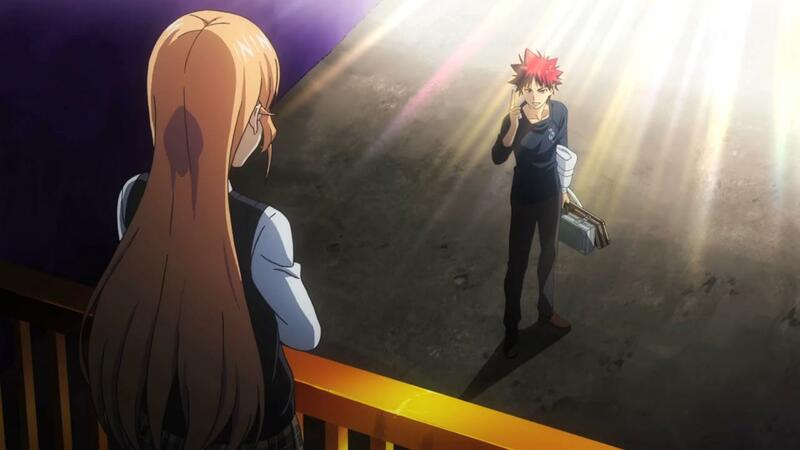 In a way, I suppose the signs were there pretty early on in the episode that Soma was going to win. 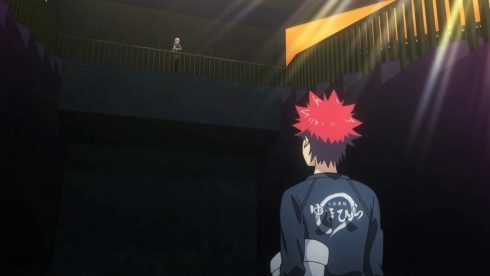 What I think lowers this episode beyond the more general dose of awesome that results from Soma winning, however, is the fact that he just doesn’t do it very well. Going back to his whole mishmash of different beef cuts, it just doesn’t sound like something that’s either practical, nor altogether too elegant. 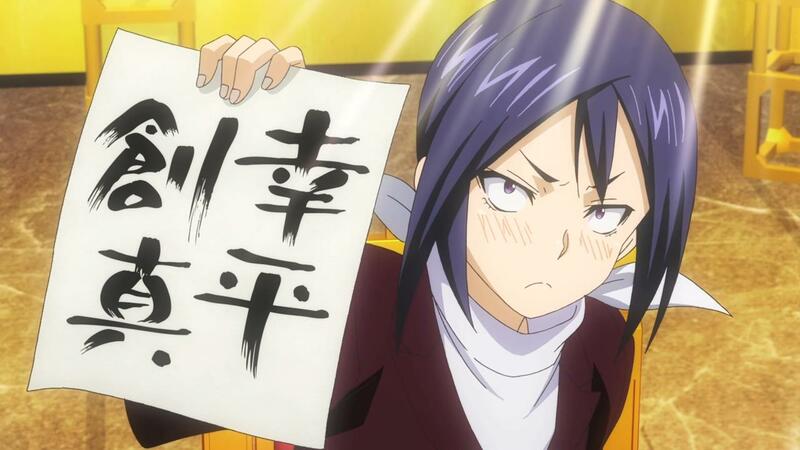 In a rather strange twist of fate, I see that Shoukgeki no Soma has about the same opinion of Academia that I do. I say that, because the big dish that’s supposed to elevate the craft of cooking to an art form rather than a practical activity, looks so darn ugly, sloppy and just too rich to really be enjoyable. 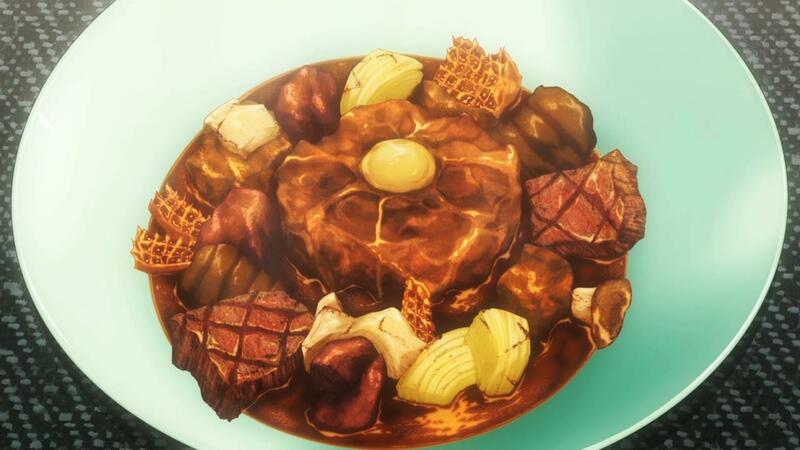 While Soma may claim to have used every bit of knowledge and experience he had to create this monstrosity of a beef stew, it doesn’t seem like it would be something that you’d fine at any diner or restaurant, let alone the Yukihira Diner itself. 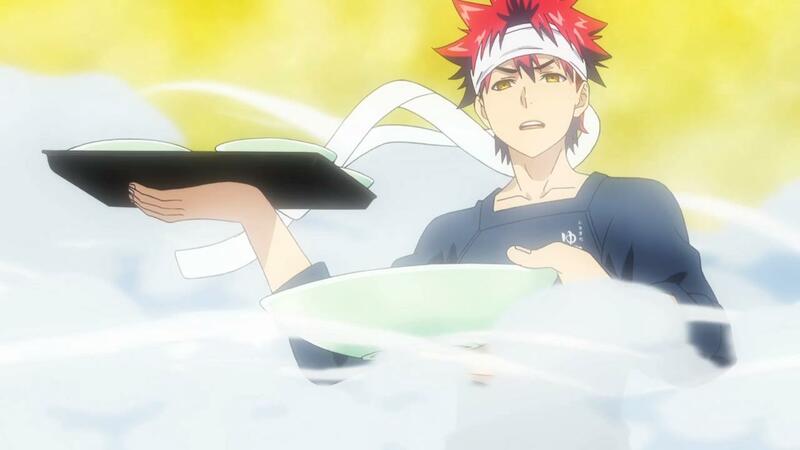 That’s a pretty big deal, because I don’t think I’ve ever felt like Soma has gone against his own mantra of cooking in such a fundamental way. 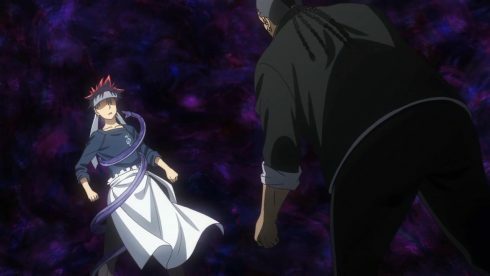 Yes, I get that Soma is all about taking multiple crazy things, and combining them into something unexpected, but there’s always a sense of practicality and cleverness to his dishes, that just felt absent here. Subaru’s dish, on the other hand, actually looked a lot more elegant and proper. 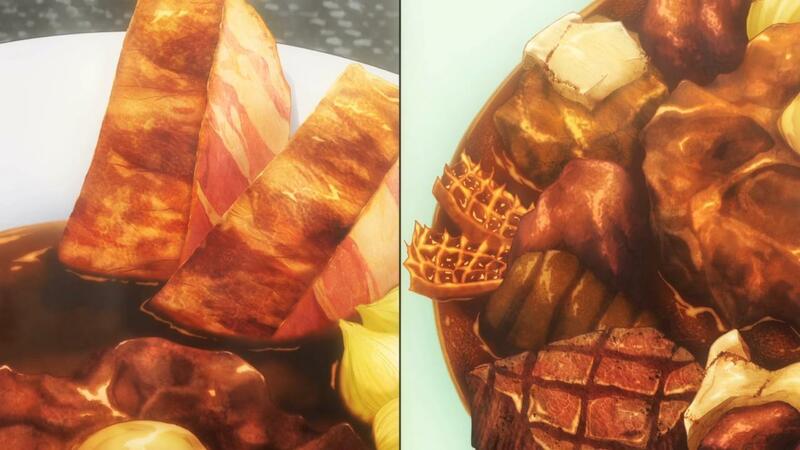 I get that he was supposed to lose, and I do see, on a very fundamental, conceptual level that his “one step farther” bacon garnished stew would loose to Soma’s “buffet of meat experiences” idea, but it just didn’t feel like a satisfying finish. 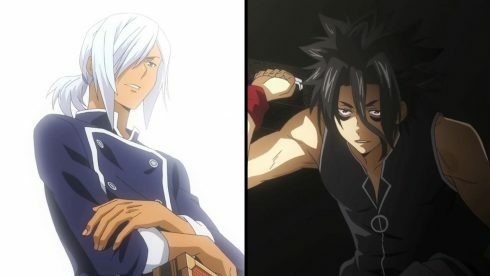 In the end, regardless of how, Soma was able to defeat Subaru, return all the tools of the previously defeated students to them, and even get Aldini and Subaru back on their feet as students. That was probably the necessary pattern that we had to go with here, but I suppose I just expect more from this series and its protagonist now, than I used to. 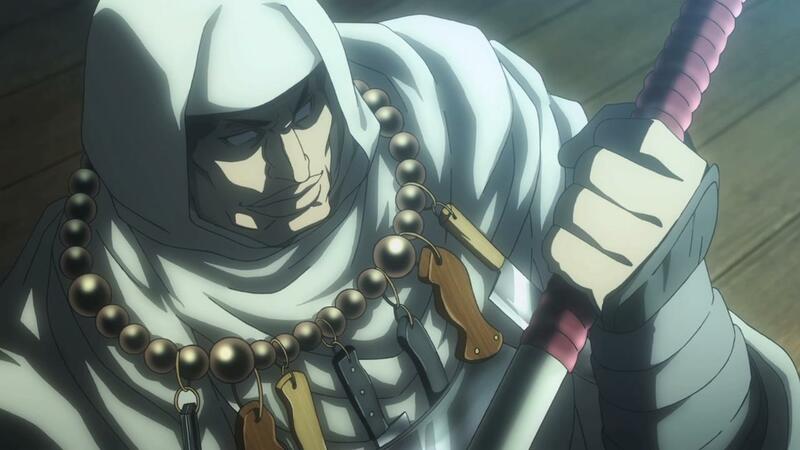 This episode and the finish to this latest arc was a significant dip in quality for a series that’s only been trending upwards so far, as far as I’m concerned. Not every episode can hit it out of the park though, and so this week may very well be one of the low points of a generally positive story. 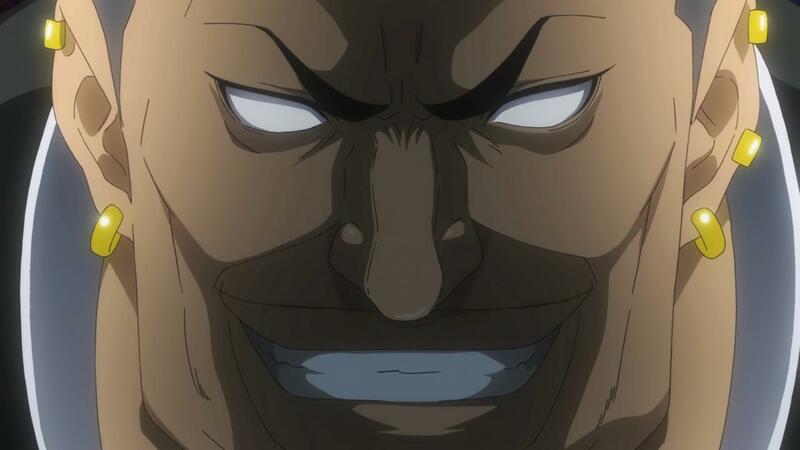 In any case, Soma’s moved on, and is prepping for his eventual challenge with Naikiri Erina now. 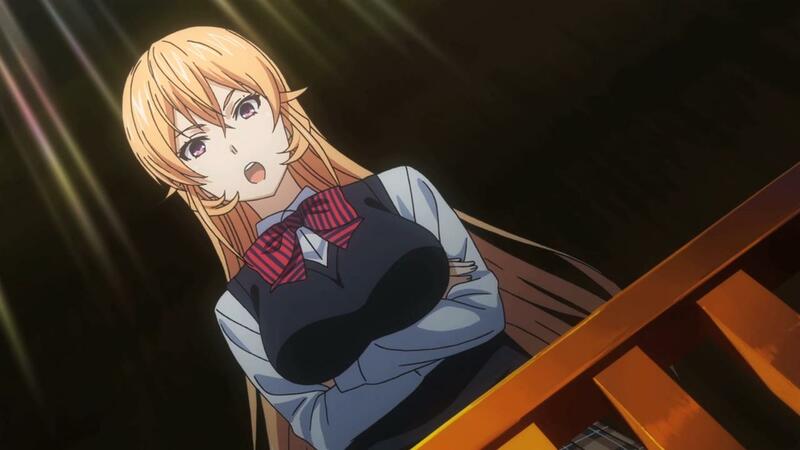 While we still have the other semi-final to look forward to, lets tackle Erina first, because it does seem like the show has been holding her back for quite a while. It does seem like she’s actually being built up as the grand finale for Soma in his first school year, rather than just a tsundere love interest. It’ll be interesting to see if Soma and Erina actually get to tussle in the kitchen, or if there’s something else that kind of puts that on hold. I will say that I am liking the angle of Erina is an actual last boss for Soma, and seeing her fall in competition and then fall for him romantically, would make her whole character arc a lot more palatable. 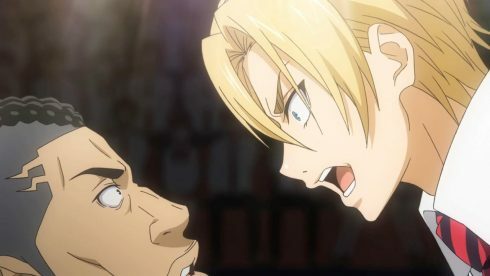 But before we can get to the final itself, and then Erina after that, we still have the showdown between Ryo and Hayama. This upcoming battle is a repeat of the good stuff we’ve seen thus far, if only because there’s no clear indication as to who will actually win this. We’ve already had Ryo win and show off his skills in grand fashion, and he has kind of been positioned as the true Anti-Soma in a lot of ways. Then there’s Hayama, who’s had this big rivalry with Soma blossom, at the very start of this Autumn elections arc. So we know that next week will definitely be an interesting match up, and it’ll be worth seeing where the series goes for the latter half of its run. Now… before I go, I would like to say, that I think this episode, at this point in time, could’ve worked as an actual closer to the first season. 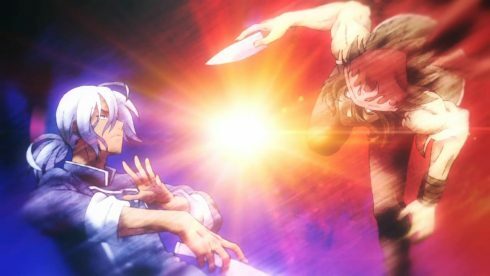 I realize that that didn’t happen, but it seems like the conclusion to the battle with Subaru, would’ve actually been a nice stopping point for the anime, until a more meaty season 2 could’ve been produced. 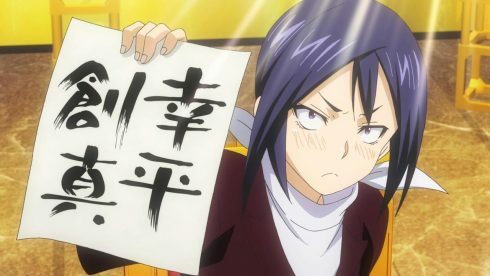 Shokugeki no Soma didn’t sell all that well on disc though, and it does seem like this season 2 may be the last we see of it, boost to the source manga or not. I’m curious to see what actual point this second series will end on, and whether we’ll actually get to a decent stopping point this time, or land back to where we were at the end of Season 1. 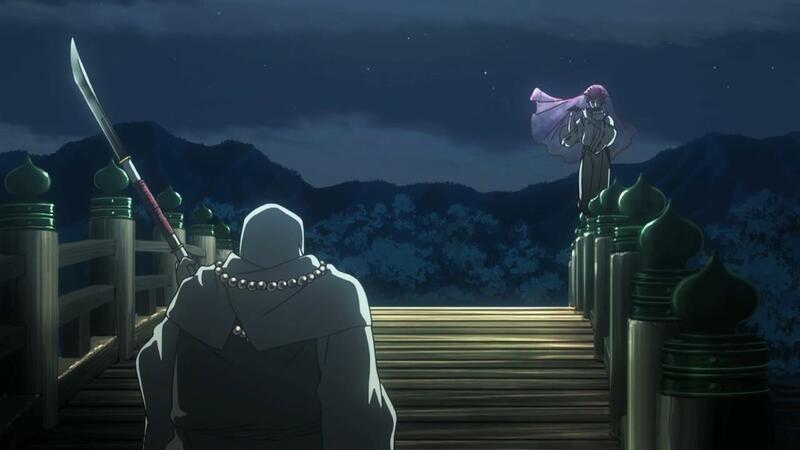 I suppose I’m getting a bit ahead of myself, but there was a certain sense of finality to this episode, and a setup of sorts for a much larger looming story ahead. Shokugeki no Soma is a franchise that you just have to savor though, for as long as you can have it. While this week’s episode was undoubtedly one of the weaker offerings from the series in a huge while, I still had fun. Even at its weakest, this show is still something that at the very least, is enjoyable if nothing else, which is more than a lot of other series can ever hope to manage.